Rounder's CLASSIC RAILROAD SONGS series proudly presents some of the best and most beloved train songs recorded since 1930. The rich history of railroad lore has provided the inspiration for hundreds of great American folk, country and bluegrass songs. Tributes to fast trains, heroes, outlaws, hoboes and disasters still capture our imaginations. Modern songwriters often portray the train as a symbol of freedom, as a means of escape from one's troubles, as the source of lost or returning love, or as a spiritual metaphor. Nostalgic songs about the age of steam reflect a longing for simpler times. The romance of railroad travel continues to inspire great music. 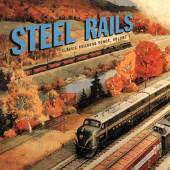 Norm Cohen, author of Long Steel Rail: The Railroad in American Folksong, shares his extensive knowledge in the booklet notes.